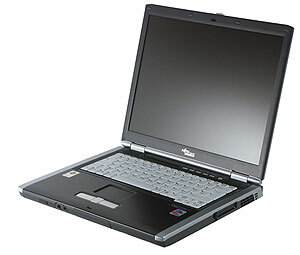 LIFEBOOK E is a representative of one of the most popular type today – full sized notebooks with a 15-inch display. Such notebooks, as a rule, combine acceptable weight and long independent working with high performance both in office applications and in 3D graphics. The model we tested is equipped with the newest Intel Pentium M processor on Dothan core and the latest ATI Mobility Radeon 9700 (M11) 3D accelerator. Supreme connectivity of the notebook catches your eyes as soon as you look at the specs. 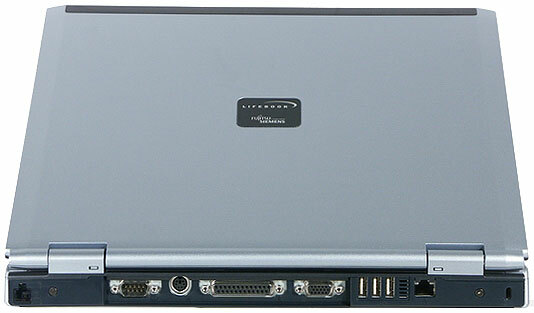 Besides standard USB and IEEE1394 ports, this notebook has getting obsolete parallel and serial ports as well as state-of-the-art wireless technologies – Wi-Fi and Bluetooth. To say nothing of the docking connector. 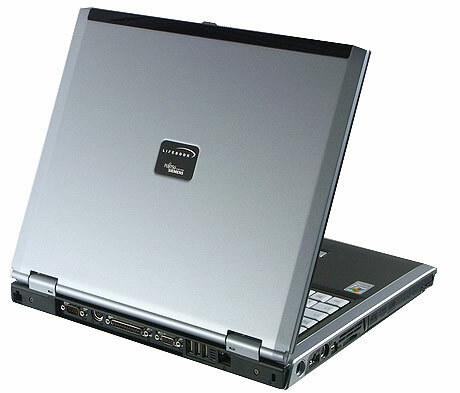 Notebook design is pronouncedly functional – it's a model for corporate users – and typical of the entire LIFEBOOK series. The black-and-silver case looks great, I must say. The front panel hosts a display panel latch, Wi-Fi on/off switch, Infrared Port, and audio jacks. Because of the combined headphone/SPDIF jack, the S/PDIF cable will be placed inconveniently when plugged in. The cover of the hard drive bay is in the middle. Modular bay for an optical drive, second hard disk drive, or second battery. The only rebuke – the USB port is too far and it's "gripped" between the power connector and the TV-out. If the TV-out is in use, it will not be that easy to get to the USB port. On the right side there are only PC Card slots and the air grating of the CPU cooling system. On the bottom there is a hard disk bay (in the central fore part), battery (on the photo to the left) and the memory module bay. The rear panel contains a docking connector. The keyboard in this notebook is of the unusual white color. Recherche, as they say. The extreme right row of buttons, usually including PgUp, PgDn, Home, End, is no more. Those functions are delegated to the two buttons located with the cursor keys. 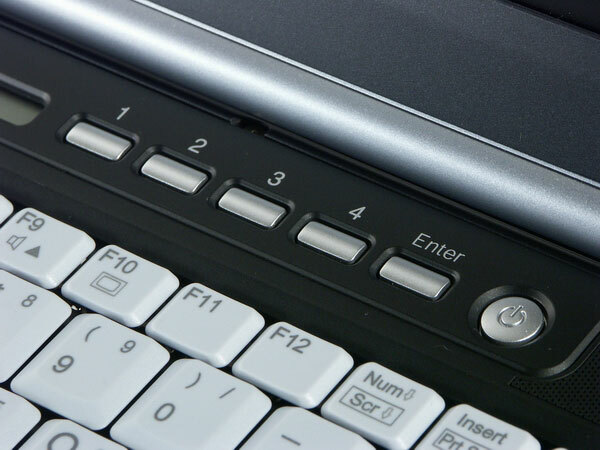 Keyboard layout with a short left Shift button will be familiar to Logitech desktop keyboard users. It should be noted that the left Ctrl button is in its "legitimate" place – in the bottom left corner. Users will be pleased with two cursor positioning devices. 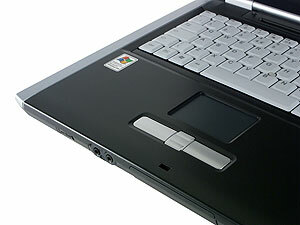 Besides a standard touchpad, this notebook also has a joystick in the center of the keyboard. 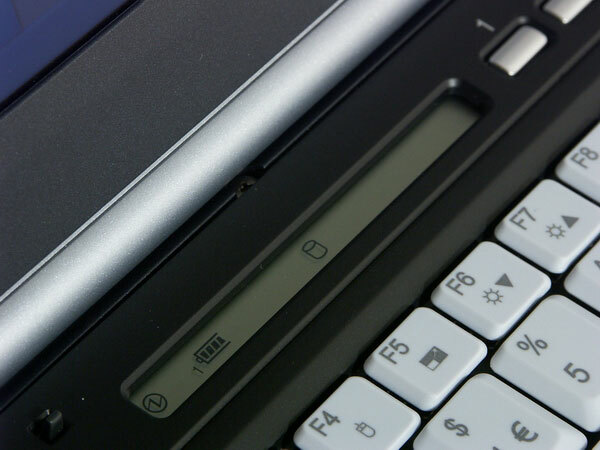 This device, named differently by different manufacturers, is very convenient when working with text – you don't have to take your hands away from the keyboard to position the cursor. Both the joystick and the touchpad are convenient, there are also vertical scroll buttons. 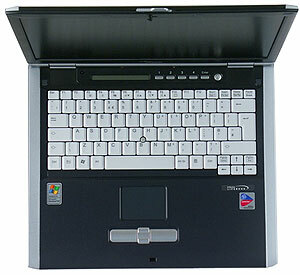 LCD panel, traditional for notebooks from this company, is located above the keyboard. It helps identify the model, no more credits can be added to this element. 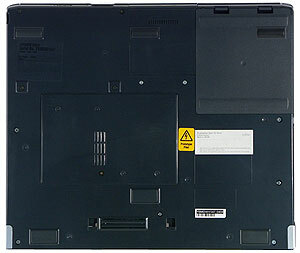 When the display panel is closed, it provides no information about the notebook status or the power status (power source, battery charging) when the notebook is off. Moreover, this LCD panel reads badly when there is not enough light. Four programmable quick-launch buttons for applications are located near the display. Them and the Enter button form the Security Panel – additional frontier to protect the notebook from unauthorized access. A user can specify up to five combinations to be typed successively at startup or when leaving the suspended mode. Password is checked at startup before BIOS is loaded. On the whole this model cuts a successful notebook for corporate use with good ergonomics and developed security capacities. 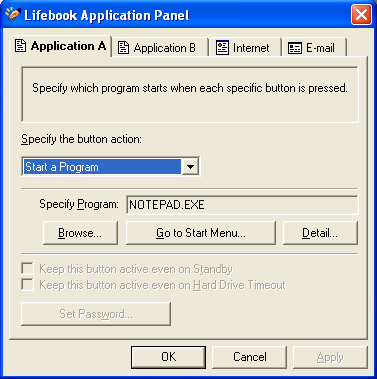 LIFEBOOK notebooks are backed up by a three-year warranty (for batteries and power supply units – 1 year). The list of service centers is published on the site. Unfortunately the warranty for notebooks bought abroad is not valid in Russia, and vice versa. The site contains a link to a database of drivers and documentation. For some unknown reasons our notebook refused to pass tests with Netscape Communicator, so the results are somewhat curtailed. Nevertheless, the tests confirm the high performance of this model, which is not at all surprising, and the claimed battery life, which is very nice. So, what's our "solid residue"? Stylish design, rich set of I/O ports (including outdated ports), developed protection from unauthorized access, excellent performance... Ideal? Well, the ideal cannot be achieved you know... But for the short period of time that I used this notebook, I noticed only one drawback – inconvenient LCD panel. Brand style.